Identification: Kokanee have a bluntly pointed, a conical head, "fang-like" teeth at the end of their jaws, and 30–40 fine rakers on their first gill arch. Males develop prominent snouts. Non-spawning kokanee are dark to greenish blue on the head and back, silver on the sides, silvery or white on the underbelly, and they exhibit no definite spotting on head, back, or tail. Spawning males develop a bright to olive green coloring on the heads with black on the snout and upper jaw, and a red coloring over their bodies and combinations of fins that vary between populations. Spawning females exhibit a less brilliant coloration than males. See also Moyle (1976a); Scott and Crossman (1973); Wydoski and Whitney (1979); Morrow (1980); Eschmeyer et al. (1983); Page and Burr (1991). Native Range: Arctic and Pacific drainages from Point Hope, Alaska, to Sacramento River drainage, California. Landlocked populations in Alaska, Yukon, British Columbia, Washington, and Oregon. Also in northeastern Asia (Page and Burr 1991). Table 1. States with nonindigenous occurrences, the earliest and latest observations in each state, and the tally and names of HUCs with observations†. Names and dates are hyperlinked to their relevant specimen records. The list of references for all nonindigenous occurrences of Oncorhynchus nerka are found here. Ecology: Sockeye is an anadromous fish, beginning life in freshwater streams, swimming out to sea to feed and mature for 2 years, and then returning to the stream of its birth to spawn and die. This fish primarily eats plankton but is also known to feed on insects and bottom dwelling organisms. Means of Introduction: Authorized as stocking for sportfishing in most states. Stocked as forage in California (Moyle 1976b). Stocked in Arizona in 1967 (Rinne 1995). Cordone et al. (1971) gave the stocking history for Lake Tahoe. Status: Established locally in some areas; failed in others. Failed in Tennessee. Rinne (1994) listed it as not established in Arizona. First found to be reproducing in the Great Lakes in Lake Huron in 1968 (Parsons 1973). Great Lakes introduction of kokanee in the 1960s and 70s resulted in naturally reproducing populations, but after stocking programs were discontinued, kokanee populations dwindled to the point where they currently persist only in northern Lake Huron, spawning in streams on Manitoulin island (Mills 1993). No longer present in Vermont (Hess, personal communication). Impact of Introduction: Kokanee was introduced to compete with, and reduce native Utah chub Gila atraria populations in Flaming Gorge Reservoir. However, it was found that under food-limiting conditions, the Utah chub was the superior competitor and was not affected by the kokanee (Teuscher and Luecke 1996). Seeley and McCammon (1966) gave a detailed discussion of impacts of kokanee on other species. Some of the impacts listed included: large kokanee populations can inhibit trout production because of competition for zooplankton; introductions of kokanee into small lakes can adversely affect even strongly established populations of rainbow trout; and late-run kokanee and brown trout may compete for the same spawning areas, especially in lower stream reaches. Introduced kokanee were at least partially responsible for the disappearance of three cladoceran species in Lake Tahoe (Morgan et al. 1978). Sometimes stocked kokanee do not have an apparent negative effect. Some of the determining factors which may influence whether this species has negative impacts on a receiving ecosystem or not are waterbody size and depth, the forage base, stocking densities, other species present, and if early or late-run strains are stocked. Seeley and McCammon (1966) cautioned that kokanee's value as a forage fish may be overrated-the species may depress rather than bolster trout populations. Its presence may not enhance a fishery, especially in waters without a deep, cool, well-aerated hypolimnion. The species is not long-lived (2 years) and in many areas the fish is only accessible for fishing for short periods in the spring and fall. Therefore, the entire population may die off after only being briefly available to anglers. Additionally, Weeber et. al (2010) found that in the Deschutes River Basin, Oregon, groups of spawning kokanee did not scour the stream bed deeply enough to reach bull trout (Salvelinus confluentus) eggs. Consequently, the data on bull trout fry emergence showed that kokanee redd superimposition did not affect bull trout egg-to-fry survival rates. Remarks: Tyus et al. (1982) mapped the distribution the kokanee in the upper Colorado basin. Oncorhynchus nerka exhibits the greatest diversity of life history traits among pacific salmon (Burgner 1991). Taylor et al. (1996) found that populations of kokanee salmon share a more recent common ancestor with sockeye that reside downstream than kokanee that reside in another drainage basin. Mass spawning events of sockeye were found to greatly increase primary production in forested stream ecosystems (Johnston et al. 2004), while smolts were found to remove up to half of the nitrogen and phosphorus their parents transported in during those spawning events (Moore et al. 2004). In the 1960s, Great Lakes exotics including sea lamprey, alewives, and smelt were abundant while lake trout, a top predator, and many planktivorous fish such as cisco and various species of chub had drastically declined. The addition of sockeye into the Great Lakes ecosystem was intended primarily to occupy the gap left by failing planktivorous fish populations and secondarily to function as a forage fish (Collins 1978). 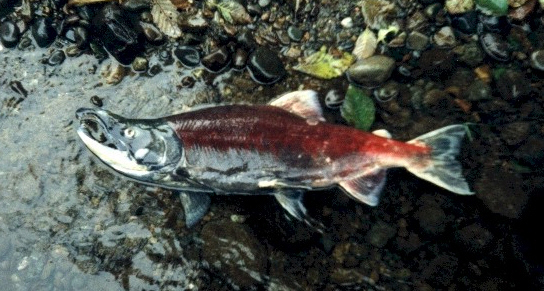 The two common names of O. nerka, "sockeye" and "kokanee" refer to anadromous and non-anadromous forms, respectively. In many cases populations of kokanee are more closely related to populations of sockeye that spawn downstream than they are to populations of kokanee in other geographic locations (Taylor et al. 1996). Brown, P.J., H. Johnson, and A.V. Zale. 2011. Effect of rainbow trout size on response to rotenone and antimycin. North American Journal of Fisheries Management 31(6):1146-1152. Burgner, R.L. 1991. Life History of Sockeye Salmon. In: C. Groot and L. Margolis eds. Pacific Salmon Life Histories. University of British Columbia Press, Vancouver, BC. pp. 3-117. Champion, P., J. Clayton, and D. Rowe. 2002. Lake Manager's Handbook: Alien Invaders. New Zealand Ministry for the Environment, Wellington, New Zealand. Collins, J.J. 1971. Introduction of kokanee salmon (Oncorhynchus nerka) into Lake Huron. Journal Fisheries Research Board of Canada 28(12):1857-1871. Dawson, V.K., L.L. Marking, and T.D. Bills. 1976. Removal of toxic chemicals from water with activated carbon. Transactions of the American Fisheries Society 105(1):119-123. Finlayson, B.J., R.A. Schnick, R.L. Cailteux, L. Demong, W.D. Horton, W. McClay, and C.W. Thompson. 2002. Assessment of antimycin A use in fisheries and its potential for reregistration. Fisheries 27(6):10-18. Gilderhus, P.A. . 1972. Exposure times necessary for antimycin and rotenone to eliminate certain freshwater fish. Journal of the Fisheries Research Board of Canada 25(2):199-202. Hocutt, C.H., R.E. Jenkins, and J.R. Stauffer, Jr. 1986. Zoogeography of the Fishes of the Central Appalachians and Central Atlantic Coastal Plain. In C.H. Hocutt and E.O. Wiley, eds. The Zoogeography of North American Freshwater Fishes. pp. 161-212. Johnston, N.T., E.A. MacIsaac, P.J. Tschaplinski, and K.J. Hall. 2004. Effects of the abundance of spawning sockeye salmon (Oncorhynchus nerka) on nutrients and algal biomass in forested streams. Canadian Journal of Fisheries and Aquatic Sciences 61:384-403. Miller, R.R., and C.H. Lowe. 1967. Part 2. Fishes of Arizona, p 133-151, In: C.H. Lowe, ed. The Vertebrates of Arizona. University of Arizona Press, Tucson, AZ. Mills, E.L., J.H. Leach, J.T. Carlton, and C.L. Secor. 1993. Exotic species in the Great Lakes: a history of biotic crises and anthropogenic introductions. Journal of Great Lakes Research 19:1-54. Moore, J.W., and D.E. Schindler. 2004. Nutrient export from freshwater ecosystems by anadromous sockeye salmon (Oncorhynchus nerka). Canadian Journal of Fisheries and Aquatic Sciences 61:1582-1589. Morgan, M.D., S.T. Threlkeld, and C.R.Goldman. 1978. Impact of the introduction of kokanee (Oncorhynchus nerka) and opossum shrimp (Mysis relicta) on a subalpine lake. Journal Fisheries Research Board of Canada 35:1572-1579. Seeley, C.M. and G.W. McCammon. 1966. Kokanee. In: A. Calhoun, ed., Inland Fisheries Management. California Department of Fish and Game. pp. 274-294. Taylor, E.B., C.J. Foote, and C.C. Wood. 1996. Molecular evidence for parallel life-history evolution within a Pacific salmon (sockeye salmon and kokanee, Oncorhynchus nerka). Evolution 50:401-416. Weeber, M.A., G.R. Giannico, and S.E. Jacobs. 2010. Effects of redd superimposition by introduced kokanee on the spawning success of native bull trout. North American Journal of Fisheries Management 30:47-54.